Monterey Bay becomes home to the latest Slide-Lok Master Dealership. New Slide-Lok of Monterey Bay Master Dealership is the second in California and further evidence of garage cabinets and garage storage market leader Slide-Lok's momentum. PHOENIX -- February 7, 2007-- Making giant strides forward in the Golden State, Arizona based garage storage market leader Slide-Lok has partnered with successful Monterey Bay businesswoman Lora Whitehead, to establish Slide-Lok of Monterey Bay. This latest Slide-Lok Master Dealership is the second in California and the most recent in a rapidly growing group of North American Slide-Lok Master Dealerships bearing the Slide-Lok name and featuring the market leader’s garage cabinets and garage storage products. Monterey Bay and the surrounding area boasts a slew of upscale neighborhoods including Pebble Beach, Monterey, and Carmel. Further north, lie Silicon Valley and outlying areas that are also experiencing explosive growth. The area’s wealth combined with the staggering expansion of the garage interiors market, makes Monterey Bay a win for both owner Lora Whitehead and garage storage market leader Slide-Lok. 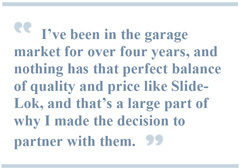 For more information on Slide-Lok garage cabinets, garage floor coatings, garage wall storage, and closets; and their patented and innovative design advantages, contact Slide-Lok of Monterey Bay at 831-630-3095 or www.slide-lokofmontereybay.com, or contact Slide-Lok at 1-800-835-1759 or www.slide-lokofthebayarea.com.